Copenhagen was just ranked 9th in this year’s ‘Most liveable cities in the world’ survey by the Economist Intelligence Unit (EIU). And this doesn’t come as a surprise to anyone! Denmark’s capital is all about enjoying the good life – it regularly tops international happiness surveys and is known as ‘the happiest city in the world’. 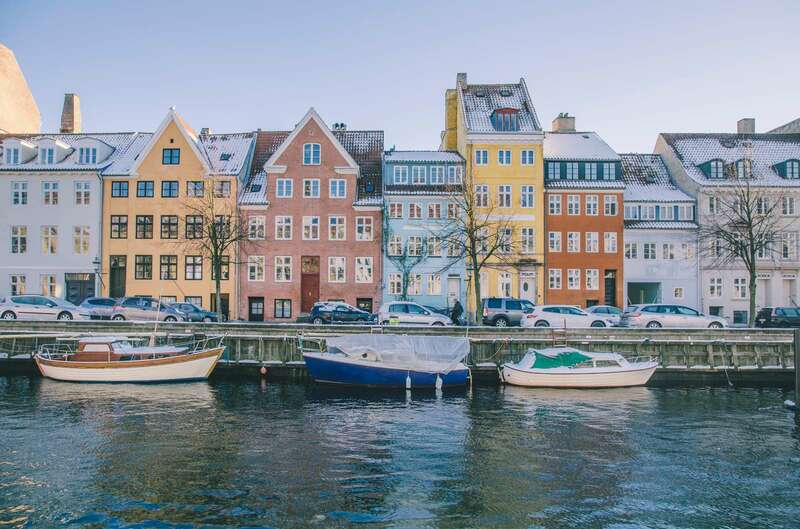 In addition to being one of the globe’s greenest, cleanest and most sustainable capitals, Copenhagen boasts world-class urban architecture sitting alongside old historic buildings and palaces, picturesque harbours and hip, Scandi-chic cafés and restaurants. With an abundance of things to do and see, the Danish capital is the ideal place for your next city break – promising to exceed your expectations and to teach you how to ‘hygge’. For a colourful and characterful, yet cosy hotel, stay at the ideally located Absalon Hotel in the upcoming Vesterbro district. Founded in 1938 and still run by the same family, the hotel is only a five-minute walk from Copenhagen’s Central Station and the city’s iconic Tivoli Gardens. Housed in a stunning 19th-century building, it offers 161 modern rooms designed by London-based designer Trisha Guild and featuring lots of colour, exquisite marble bathrooms and organic Karmameju toiletries. The salon at Absalon Hotel is the perfect room for curling up on one of the deep armchairs dotted around the bright room with a glass of wine. During the day, you’ll find people tapping away on MacBooks or reading a book in the corner while sipping on a latte and as the evening rolls and the colourful open space takes on an all-together different glow, cheerful groups of friends, families and couples flock to the bar for a cocktail after a day of exploring the streets of Copenhagen. Continental breakfast can be enjoyed in an expansive room just a few steps away from the bar. Expect all of the continental buffet staples with the thoughtful addition of some Danish classics, including freshly baked pastries, local cheese and herring. Whether you’re visiting Copenhagen for business or pleasure, Absalon Hotel’s convenient location, modern décor and truly impeccable service make it a wonderful place to rest your head at night and wake up to in the morning. With its Michelin-starred restaurants and clever Nordic cuisine, Copenhagen is known as a true culinary powerhouse. Mielcke & Hurtigkarl’s experimental and exciting menu however, instantly made it our favourite find! Set in the beautiful Royal Horticultural Gardens, the restaurant promises an experience like no other. Designed to ‘make your taste buds dance’, the chef’s secret tasting menu is arguably the finest and most daring food you’ll find in Copenhagen. From appetisers such as yeast chips and tiny egg-white, meringue-like baguettes filled with mozzarella, tomato and basil, through to the last bite of delicate pistachio cake served on a wooden board accompanied by a printed out poem by Michael Faudet, the dining experience at Mielcke & Hurtigkarl is a gastronomic adventure that resembles a form of art. With its magnificent high ceilings, white walls and a solitary tree in the centre of the room, the restaurant’s plant-inspired décor is nearly as extraordinary as the food itself. In summer, tables spill out onto a patio terrace in the garden and the atmosphere is so magically laid back that you’d be happy to linger over the extensive number of courses (and the sublime wines paired superbly to complement each dish).